close to home, the Manatee seemed the obvious next choice. In retrospect, it would have been a lovely paddle during the fall or spring months. The Manatee River passes through Lake Manatee in Bradenton, and then continues on its westerly way to eventually empty into the Gulf—a 46-mile journey. As it nears the Gulf, it widens and acquires estuarine qualities in the flora and fauna. The section closer to the lake—where I paddled—is the Upper Manatee River and is designated as a State Canoe Trail and Greenway. Lake Manatee did not always exist. In the 1960s, officials built a dam on the river to create a reservoir for the surrounding areas—and thus created Lake Manatee. When Tropical Storm Debby came through mid-June of this year and dumped some much-needed rain on Florida, the dam was opened wide to prevent flooding. The few paddlers who attempted the trip to the dam returned very quickly, unable to paddle against the strong current. So, the river slowed down, and I rented a sit-on- top kayak at Ray’s Canoe Hideaway (well-hidden and very unpretentious). Ray’s sits on the river about 5.5 miles west of the lake. My goal: to make it to the dam and back. Along the way, I paddled past beautiful white sandbars that on a cooler day would have tempted me to stop and play. High sandy banks with overhanging trees clinging to the sides showed wear and tear of storms past. Oaks, cabbage palms, saw palmettos, slash pines, and pond apples edged the wide river but offered little shade. The wildlife seemed to know to stay out of the sun. I saw a blue heron, a turkey vulture, and one lowly turtle. An occasional fish jumped around me, probably searching for a cooler spot in the water. I turned on my camera, and it lit up with a warning, telling me that it was just too dang hot, and then it shut itself off. My IPhone screamed TEMPERATURE! However, even in the heat, some found enjoyment on the river: a dad canoeing with his two young children (picture), a group of teenagers swinging on ropes and splashing in the cooler waters in a rare shady spot. One yakker even offered to share his cold beer with me. 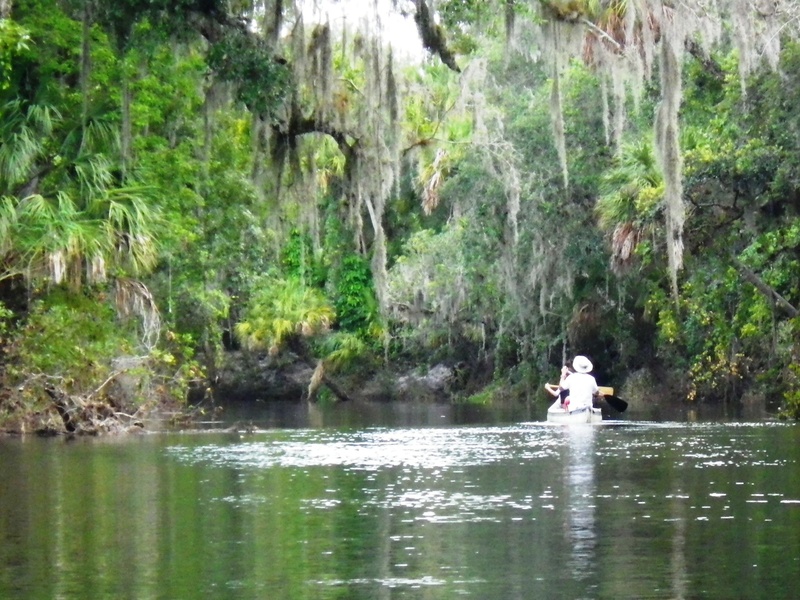 I paddled against the current, light at first, but growing stronger as I neared the dam and Lake Manatee. I made it about 3 miles up, just past the bridge and Rye Wilderness Park. The current was getting stronger, and my time on the river was running short. I turned around and enjoyed the easy paddle back. (Outfitter: Ray’s Canoe Hideaway on the Manatee River, 1247 Hagle Park Road, Bradenton, FL 34212. Phone: (941) 747-3909 or (888) 57CANOE). Have you tried the Rainbow River? Yes, it was one of my first rivers and lots of fun. I have not paddled the Crystal River yet, though. That’s up in that general direction.